Iconic elegance of the Great Gatsby and The Art Deco period reflects in the timeless sautoirs necklaces from the Symphony collection. Spectacular pieces represent sculptural motifs as shapes contort to create beautiful compositions of a timeless symphony. 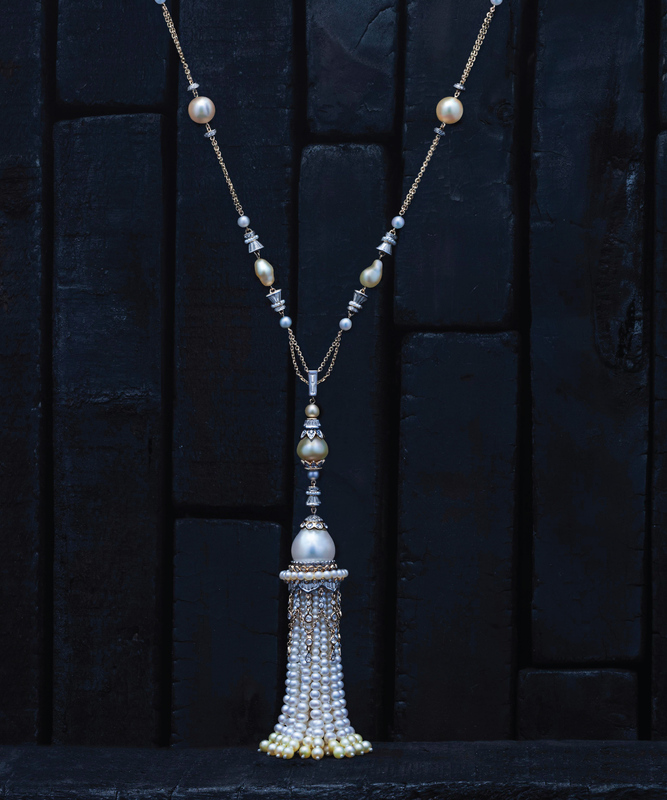 Celebrating various styles of knots, tassels and strings, sautoir necklaces showcase a rare selection of Japanese Keshi pearls, Tahitian, Baroque and South Sea pearls. Baguettes, round brilliant cut and rose cut diamonds are accentuated with a glimpse of emeralds, rubies and sapphires. Creating a sophisticated blend of precious materials, peach and cream cultured pearls balance graceful baguettes. Round brilliant cut and rosecut diamonds underline the bigger cream South Sea pearls in this sautoir necklace. This timeless sautoir in 18kt gold shines with elegant Baroque South Sea and peach Akoya pearls, with sparkling baguettes, round brilliant cut and rose cut diamonds. Vivid colours of Burmese rubies bring to light the glow of 160 carats of golden South Sea and cultured pearls. Crafted in 18kt gold, this sautoir necklace inspires a smooth silhouette of fine baguettes, round brilliant cut and rose cut diamonds.